After doing the first few "A Day in the Life" strips, I quickly began stream-lining and simplifying the characters. Most artists I think find after they draw a character repeatedly, they end up finding ways to draw that character in the most economical way possible. Looking back at these strips after having done them almost ten years ago, I see the evolution of them more clearly. 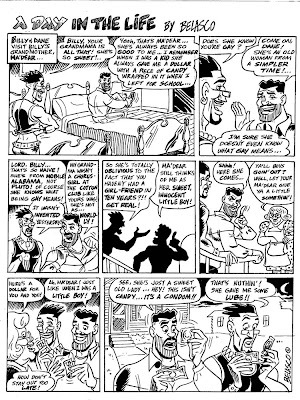 The first couple I've posted were definitely done under the influence of Tim Barela, the creator of Leonard and Larry, one of the oldest gay slice of life comics that I knew of and a big inspiration to me as to how I would do "A Day In the LIfe". The strips to follow are much more in my own cartoonier style. What I like about all of these strips is we can focus on your sharp cutting wit. Its great to see all the directions you take your art.